Bisabolol is a sweet and delicate floral terpene with hints of spice and cinnamon. 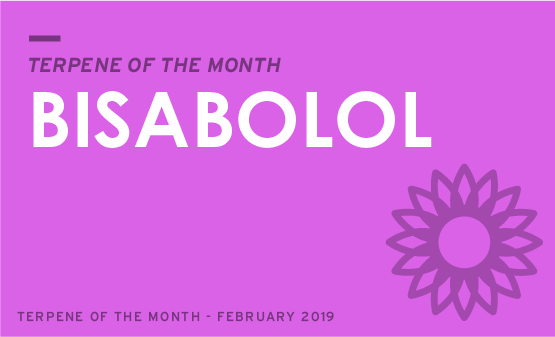 Besides being found in cannabis, bisabolol can be found in chamomile, South American candeia trees, and several other floral plants. Similar to chamomile, bisabolol exhibits soothing properties and even has been shown to provide pain relief. Due to the chemical nature of bisabolol, it can help other solutions penetrate the skin for a more effective treatment. For this reason, it is often found in medicated topicals and lotions. It also shows promise as a skin and wound healing treatment, as it has anti-microbial and anti-inflammatory properties. Fun Fact: Due to the skin healing properties of this terpene, it can often be found in the cosmetic industry, where it is used in soaps, perfumes, sunscreens, anti-aging treatments, lipstickers, facial cleaners, moisturizers, and more!